The S2G commercial truck is the only factory-installed, fully integrated propane autogas engine designed to stand up to the demands of the medium-duty truck market. 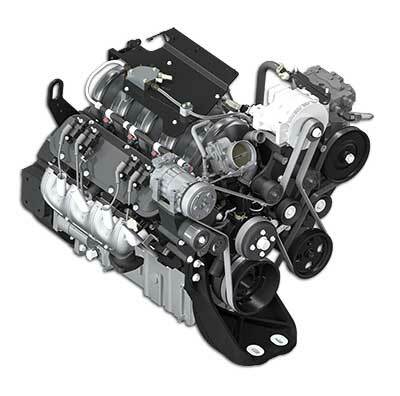 The DriveForce 8.0L propane engine delivers reduced emissions compared to diesel, with the best available balance of power and torque. 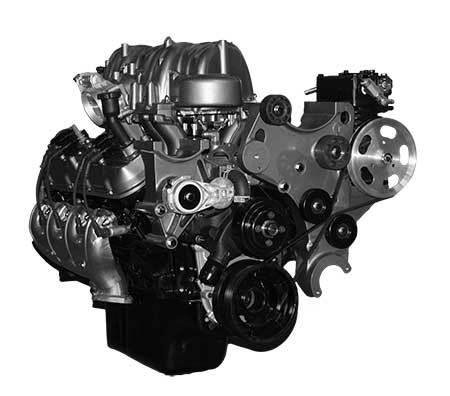 Its proven engine block has been updated and improved to increase reliability, and the entire powertrain is sold, warranted, and supported by Freightliner Custom Chassis. The all-new DriveForce 8.8L delivers uncompromised power and performance, with maximum fuel efficiency and emissions certification. Its patented LPI fuel system improves efficiency while its durable block ramps up the torque for enhanced hill-climbing power. Liquid Propane Gas (LPG), or propane autogas, is created by refining petroleum or natural gas. When used to fuel internal combustion engines, LPG reduces nitrogen oxide and carbon emissions, making it a cleaner-burning fuel than diesel or gasoline. Although LPG has a lower energy content than traditional internal combustion engine fuels, LPG vehicles are less expensive to operate due to the lower cost of the fuel and fewer associated maintenance costs. LPG vehicles deliver approximately the same power, acceleration and cruising speed as traditionally powered vehicles. 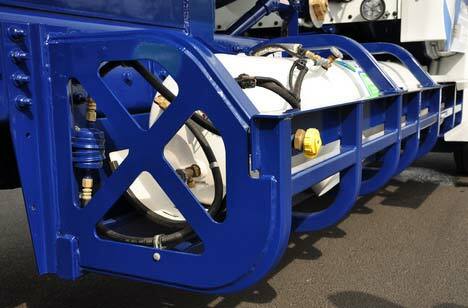 The S2G truck is powered by a Liquid Propane Injection (LPI) system. LPI is a fully integrated and factory-installed propane autogas fuel system; no aftermarket modifications are required. It’s a factory-engineered solution with numerous benefits. As an alternative fuel source, propane autogas enjoys the longest driving range of any optional alternative fuel product, with no tradeoffs in power and drivability. The system engineered for the S2G in particular is the most advanced liquid propane injection system currently on the market today. It’s EPA and CARB certified, and it’s less expensive to operate, due to the lower cost of fuel and fewer associated maintenance costs from this efficient fuel source. Right now, many Federal and state incentives encourage the use of propane autogas, and there are already more than 2,600 LPG fueling stations nationwide. One gallon of propane autogas generally costs 40 percent less than a gallon of gasoline, so switching fuels to autogas can save fleets thousands of dollars annually over gasoline or diesel. And, beyond the clear advantages of being a Freightliner Custom Chassis product, the S2G truck offers savings in a number of dimensions. The integrated Liquid Propane Injection (LPI) system lowers operational costs and reduces emissions, all while maintaining the payload capacity and performance offered by conventional fuels. Savings without compromise is the S2G value proposition. In addition to the fuel and emissions savings of the S2G truck, there are Federal and State incentives that can make the switch to LPI power even more attractive. Currently, there are more than 110 incentives offered by states to promote more environment-friendly and energy-efficient transportation that runs on propane autogas. Incentives include grant programs, loan programs, leasing programs, tax incentives and credits, rebate programs and exemptions. For a complete list of Federal laws and incentives for propane autogas, click here. To search for incentives by State, click here. Not only does the fuel efficiency of the S2G truck deliver more profit to your bottom line, so does the lower maintenance costs of the S2G and its Liquid Propane Injection (LPI) system. The S2G truck is designed to keep drivers on the road longer with less maintenance using the proven FCCC S2 chassis, known for its durability, reliability, maneuverability and payload capacity. Utilizing this popular chassis also increases the accessibility and availability of parts across our 450+ nationwide dealer service centers. For standard maintenance requirements on the engine and fuel system, look here. Check out this video for more on the financial advantages of choosing propane autogas - especially for fleets.